Lucky Dias is a driven and determined actor who has risen to the very top in stardom. With good looks and a pleasant disposition he is not letting success go this head. Genuinely down to earth, cheerful with a wise head on his shoulders Lucky has made niche in the film world. An actor with a beard, contrary to those with a clean shaved face familiar in the films produced two decades ago, changed the stereo typed actor image. This changed appearance of an actor in filmdom won the hearts of film fans. Lucky unlike the other actors who shone for a short time and then disappeared into oblivion was a star born. As a young man involved in advertising never in to classical or traditional arts being more towards the westernised world, he never thought he will be drawn into the field of performing arts. Paying his whole hearted tribute to his Guru, Dr. Ananda Tissa de Alwis, Lucky spoke about his unexpected entry into acting. "All my success I attribute to my Guru, who made me see a different world altogether by taking me to various concerts and kala happenings. It was Ravi Shankars visit to Sri Lanka which became a turning point in my life. 'I was taken to a concert he was performing and I was simply mesmerised by the maestros dextrous use of his fingers. I spoke to the maestro and was automatically drawn towards the traditional form of arts. "In the field of advertising which I was involved in I had many friends from different segments of society. These contacts helped me be involved in a radio production named Vajira by Ananda Sirisena. Later it was made into a film in early 80s by Dr. Sunil Ariyaratne. The film held its shooting at Kuliyapitiya and Lucky received overvelming response from the crowds watching the production . This film enabled him to meet top stars in the silver screen. His role as a police inspector in the film revealed his hidden talents which made him continue in the film scene as one of our leading popular and most sought after actors. "Until 83 I did not take things seriously. This was the time tele dramas began. 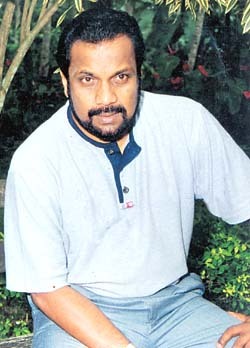 I performed in a one hour Avurudu story by Thilak Gunawardana and Bandula Witanage in 83. My first role in tele drama Nirupamala with my full faced beard brought me instant fame and in my view a star was born", says Lucky. The tremendous response he received in his second tele drama Yashorawaya saw Luckys popularity sky rocketing. With his popularity high, he acted in 22 films including Ahinsa, Newa Gilunath Ban Tune, Siri Medura, Madu Samaya, Kula Geya, Antima Reya and Paradese. Lucky is concerned about the pathetic plight of the film industry. Though, the film Ahinsa by Malini Fonseka was a huge success, the other films were not. Today we do not get house full situations until a week passes. I consider myself very unfortunate to be on top in the industry, when things are looking gloomy, Lucky said. During his involvement with the industry he won many awards. "I came in as a tele drama actor. It is sad to note the plight of the other film actors. I am glad that I do not act in films due to the poor quality of the films produced today over shadowing the good work done by the yester year directors". "We as an industry have to grow. I like competition, neck to neck performances rather than labelled with the best actor tag. But I wonderbeing whether there is any future. According to him, artistes have not been given due recognition. It is time to change peoples attitudes towards artistes and to help them maintain their self-respect.